VW threatened by new lawsuit: patent infringement in networked car? Chip manufacturer Broadcomm has filed patent suits against VW before two German courts. The lawsuit could result in billions in damages for VW and threatens the entire automobile industry with its new models. It is about the key patents for the networked car. According to a report in Der Spiegel, Broadcom sees 18 of its patents infringed, which are particularly relevant for navigation and entertainment systems in the modern automotive industry. The chip manufacturer has filed suit in both Mannheim and Munich. In total, the US chip company is demanding the payment of one billion dollars. Volkwagen AG confirmed the receipt of Broadcomm’s patent lawsuits on Friday, but did not comment on the details. VW has meanwhile started talks with Broadcom, according to Der Spiegel. Broadcomm has been active as a chip manufacturer for many years. In 2008 they drew attention to themselves when they accused their competitor Qualcomm of patent infringement before an U.S. court. But already in 2009, Qualcomm and Broadcom reached settlement and patent agreements. The core patents were for baseband processor chips that enable the basic communication functions of a mobile phone and other functions such as graphics, multimedia and data transmission. Qualcomm agreed to pay Broadcom 891 million dollars over a four-year period. In May 2018, both chip manufacturers hit the headlines again: Broadcomm had indicated that it was attempting to acquire Qualcomm as a company. But surprisingly, even before Qualcomm and Broadcom officially agreed on a deal, US President Trump blocked the merger, citing national security concerns and key expertise in 5G mobil technology. The example of Broadcomm’s 7,530,027 patent illustrates the patent claims of the chip manufacturer. The patent granted in 2009 introduces a new system for processing graphic images for display. The system includes a window control to obtain data describing windows in which the graphics are displayed and to sort the data by the respective depths of the windows. The contested patents also include, for example, a method and device for producing a dynamic model for determining the position of a satellite receiver (US Patent 6.937.187 of 2005). Broadcoms’ targeted action against VW is of great importance for the entire automotive industry. The lawsuit is brought against the manufacturer of an end product. It has the highest margin and offers the plaintiff the greatest leverage in possible compensation payments. 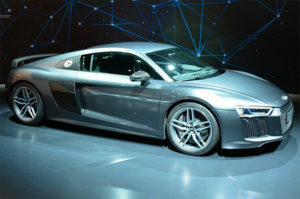 In addition, the networked car has been part of all modern car models for years. It is therefore not surprising that Broadcomm opened a similar lawsuit in the USA at the same time. In May 2018, following a complaint by chip manufacturer Broadcom, the U.S. International Trade Commission initiated an investigation into the products of Japanese companies such as Toyota Motor and Panasonic for alleged patent infringements in vehicle entertainment systems. It is certainly part of the calculation to attack mainly high-circulation car models with Toyota and VW in order to take a strong position in possible licensing agreements. Of course, the car industry is also looking for alternatives. The US patent pool Avanci, for example, offers patent licenses for the Internet of Things and radio technology. Car manufacturers and their suppliers can use the patents in return for a license payment. In Avanci, Qualcomm, Ericcson, Sony and Vodavone, among others, have added standard essential patents to the pool. Do you need support in patent and licensing law for your brand? Our Patent Attorneys and Attorneys at Law bundle are experts in patent- and trademark law, national and international.